A blend between ancient tribal weaving techniques and modern artistry, this handbag is hand-crafted by artisan Chirada Loetparisanyu with cotton and leather. 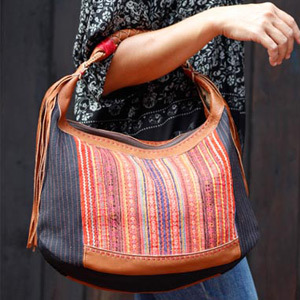 Its exterior is adorned with vibrant embroidery and stitching done by hill-tribe women's expert hands. Lined in velvet, it features three inner pockets, one with zipper, while the bag itself closes with a zipper. 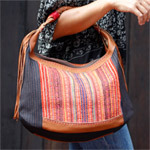 Large braided leather handle and leather fringes complete the design. A lovely ethnic addition to any contemporary outfit. Materials: Velvet (cotton) 40%, cotton 40% and leather 20%. This handbag is handmade by Chirada Loetparisanyu. She works from home in Chiang Mai.